For the latest Construction News 4/10/19 click here. This year there are 4 ways to support struggling moms. Support the moms by writing a check to Catholic Charities – Bottom Line Diaper Bank . Bottom Line is able to purchase diapers at a bulk rate and then distributes them to many charitable organizations. Purchase or make a card to express support for these moms. Pick up a prayer card in the Gathering Space and pray for these moms during the month of May. Family to Family members will be in the Gathering Space the weekend of May 4-5 to gather your donations, and cards after all Masses. Prayer cards will also be available. Details: If you are interested in prepping or serving a meal at one of the Denver Rescue Mission locations, let us know! We need a general headcount and preference for meal prep (4-6 ish) vs serving (5-7 ish) prior to booking the volunteer event. If you are interested, please email MPBYoungMarrieds@gmail.com with your preference of date and activity by April 15th and we will get it booked! Details: We have 6 FREE premium tickets to the season opener of the Outlaw Lacrosse game at Mile High Stadium!! If you are interested in attending, please let us know ASAP. Sit and Sort 4 Birthline! Join MPB teacher, Cathy Collins, as we support moms at Birthline. Birthline is an organization which supports the lives of the unborn by supporting young women with counseling and support. Birthline needs 75 volunteers to help sort donated clothing items. Bring a chair, “sit and sort” and meet new friends as you help these moms. Lunch & bottled water provided. Many enjoyed a lively evening with community as we explored Catholic Social Teaching. MPB Justice Matters Ministry hosted the evening where we discerned our “Lenten Campaign for Action” by living our faith through the seven themes of Catholic Social Teaching. Interested in learning more about Justice Matters, contact Ann. Through your weekly generous donations, social outreach committee was able to support the following agencies during this 3rd quarter. Please visit these agencies on the web and explore the good work they do. Thank you for your support. From Family to Family-Thank you! A resident at Tapiz Apartments called to thank the MPB parishioner who sent her a Valentine. She was so surprised and appreciative. The Valentine made her day! She said it was the only Valentine she received. Thank you for the time to reach out to one who needed to be lifted up! Please join every Friday evening during Lent at 5:30 pm for Stations of the Cross. Come gather in community to briefly explore each of the seven Catholic Social Teachings, reflect on scripture, and share in conversation. This is a wonderful way to connect with others and journey together through Lent. Join Angeline Hubert and the Ladies of WOO at our Lenten Retreat -The Lenten Journey: A Call to Conversion. Vatican II’s Constitution on the Sacred Liturgy speaks of Lent as a time when we can grow closer to the Word of God. As we begin our Lenten journey, we’ll look at that Word and reflect on what it tells us about our call to conversion and new life. This week’s theme is: Life and Dignity of the Human Person. Every human person is created in the image and likeness of God. Therefore, every person’s life and dignity must be respected and supported from conception through natural death. We believe that the measure of every institution is whether it threatens or enhances the life and dignity of the human person. Source: Minnesota Catholic Conference. This information has been adapted from: “Catholic Teaching and Principles,”U.S. Conference of Catholic Bishops. During Lent this year, we will focus on Catholic Social Teachings and how we live what our faith calls us to do. We have three ways to focus on these during Lent. Stations of the Cross: Many of our stations will have a focus on this theme. Stations will be held in the church on Fridays at 5:30 and will be hosted by various MPB groups. Because of our challenges with space there will not be a soup supper following the services and we encourage parishioners to connect and join in community at local restaurants. Our first stations will be hosted on March 8 by the Second Half of Life ministry with a theme of “Social Justice”. An Evening of Reflection and Conversation on Catholic Social Teachings: Come gather in community to briefly explore each of the seven Catholic Social Teachings, connect them to scripture, and share in conversation. The evening will be held on Tuesday, March 12 from 6:30-8:30 pm in the RCIA room and is hosted by The MPB Justice Matters Ministry. Your Love Has Been Shared! The MPB community has made many of those held in detention felt loved this Valentine’s Day. We delivered over 550 wonderful homemade Valentines to our brothers and sisters. Along with Valentines, WOO ladies braved the cold and made 40+ heart pillows for cancer patients. Along with the pillows, over 100 personal notes of encouragement were shared. WOO ladies also crafted 75 heartfelt Valentines for the detainees. Day To Serve Volunteers joined MPB teacher Anne Schwieterman in serving over 100 residents lunch at The Denver Rescue Mission. Blessed are you for lifting the poor in spirit, thank you! On January 23 at a gathering of parish staff, project architect and contractor, Fr. Pat blessed the new Parish Office in a small ceremony. The staff also took the opportunity to thank a special parishioner who facilitated the donation of gently used office furniture to furnish all 15 offices, 3 conference rooms, open workspace and reception area, saving the parish thousands of dollars. The 10,000 square foot space is spacious, airy and full of natural light through both numerous windows and several sky lights. Everyone is welcome to stop in and visit the new offices and see the outcome of your generosity through the Here for Good capital campaign. The old offices in the former convent will be coming down in the next month, making room for a new artificial turf field and playground for the school, to be opened in early 2020. The “big dig” creating space for the basement of the new Parish Center is progressing on schedule, as are the upgrades in the sanctuary, including the fire suppression system, new interior paint, new sacristy and new sound system. Click here to catch up on the latest construction news. As we prepare to see the former convent come down later this month, many have asked why we just didn’t renovate that building instead of tearing it down and building a new building. Parish leadership, both the administration and the Finance Committee, investigated many options in determining the best use of our space and value for our dollar. In the end, it was going to be far more expensive to refurbish the 50+ year old building than proceeding with renovating the former Parish Center and building a new Parish Center. However, throughout the process of moving out of the building, every effort was made to reduce expenses and reuse or recycle as much as we could. Habitat for Humanity Restore, Second Chance Center and some of our own staff and parishioners were the recipients of most of the furnishings from the building. The majority of boxes used for packing were second-hand and then passed onto another nonprofit after we were done. Thanks to the parish staff and many volunteers for helping to pack up the entire building and church before moving. As was shared in a recent bulletin, all of the furniture in the new offices was gently used prior to our acquiring it at no cost, thanks to parishioner Ben Diaz who facilitated the donation. And, thanks to the generosity of long-time parishioner Adel Nassif, we have been able to store the contents of the Parish Center and all donated furniture throughout this extended transition period at no cost. Dollars raised from the Here for Good capital campaign have been carefully stewarded throughout the construction process. Every single gift, regardless of size, has enabled the parish to get closer to the total project cost of $9.7 million. With just $2.3 million left to go, everyone will be asked to consider extended their pledge or making a new pledge if they haven’t yet supported the campaign. With every dollar donated, please know how much your gift is appreciated and spent wisely. Click here to catch up on our latest photos of the construction site. Join us as we share our love with those being treated for cancer. Our next gathering will be Thursday Feb 7 where we will be creating hearts for Project Valentine. Project Valentine brightens the day for over 570 cancer patients young and old, at 18 infusion centers across the metro area on Valentine’s Day. We’ll gather in the school cafeteria from 6:15-8:00. No sewing experience needed. Bring a friend and craft and serve in community. You were over the top at Christmas providing Holiday greetings to over 950 detainees at the Aurora Detention Center, thank you! So, here’s another opportunity to share the love. We are showing our support for our brothers and sisters with Valentine cards. These cards will be distributed to detainees and day laborers. Homemade cards can be dropped off in the gym in the tubs marked “Share the Love” the weekend of Feb 9-10. Deadline for cards is Feb 11. Important information for the cards at: tinyurl.com/sharethelovempb19 or contact Ann Zimmer. PLEASE make sure you have returned the bottom portion of the card for your family. We are missing 15 slips from the bottom of the cards that were taken. It is important for us to track who has been sponsored so that no one is left out. You can leave the slip in the offertory basket, drop it off in the office or mail chute, or call Ann with the information. Thank you! Reach out and connect with your family or senior before Nov. 12 to introduce yourself. If you can’t reach your family or senior, be persistent, try try again! Also, you can contact a coordinator listed on your card for assistance. Family to Family Thanksgiving- A great way to connect with Seniors! Thank you for lifting up our seniors at Tapiz and North Lincoln. Your generosity is over the top! We are delivering the bags to the seniors on Nov 13. We’ll be leaving MPB at 11:15am, and return around 1:15. If you’re interested in helping to deliver and enjoy a pizza lunch with the seniors at North Lincoln or Tapiz on the 13th, contact Ann Zimmer azimmer@mpbdenver.org 303.756.3083. A great way to kick off the holiday season and perhaps meet your senior! Creation Care invites you to join in community as MPB welcomes Christopher Pramuk, Ph.D. from Regis University Monday, November 12, 2018 7:00 pm- 8:30 pm in the RCIA Room. “Contemplation and the Suffering Earth: Thomas Merton, Pope Francis and the Next Generation”. Dr. Pramuk will speak on Thomas Merton’s experience of the Divine presence in nature, Pope Francis’ call to environmental conversion in his encyclical Laudato Si, and how the current emphasis on information technology is shaping all of us, and perhaps especially young people today. Dr. Pramuk’s books will be available for purchase. Join us for this three part series this Fall examining three areas of “stuff” we deal with at this stage of life. All three evenings will take place in the Gathering Space/RCIA Room from 6:30-8pm. Change and the transition that follows is a normal part of life, yet it can be frightening. In this workshop you will learn about the three phases of transition and how to understand them. This is a roadmap for successfully navigating change and moving into the future. Join the ladies of WOO on Thursday, Nov. 8 6:15-8:00 pm, as we make blankets for Brent’s Place. We’ll be meeting in the school cafeteria. Join in community as we serve others and also learn about the wonderful services offered by Brent’s Place for children with cancer. For more information contact Ann Zimmer azimmer@mpbdenver.org or get more details at: https://tinyurl.com/Brent-sWOO18 All ladies are welcome! If you missed your opportunity to sponsor a family or senior, please contact Ann. We do have a waiting list and many times we have late applications. We are looking for interpreters to assist in communicating at the gatherings and phone calls. If you speak Spanish or another world language and would like to assist, please contact Ann. Thank you to the MPB community for your support that reaches out to over 900 people over the holidays! Kiosks with family and senior sponsor cards will be up in the gathering space for one more weekend- Oct 27-28. Don’t miss the opportunity as they go quickly! The Lazarus Bereavement Ministry invites all parishioners to an All Souls Day Mass on Friday, November 2nd at 7pm in the church. This special liturgy will be an opportunity for all those who have lost a loved one to honor and celebrate those lives with the MPB community. You are invited to bring a picture of your loved ones with you. Are you looking for ways to get more involved in the parish community? Are you wondering which ministry is a good fit for you? Next weekend, October 13/14, Pastoral Care, Social Outreach, Liturgical Ministries and Music Ministry will have sign up tables and representatives in the gathering space to answer questions about these ministries. Kiosks with family and senior sponsor cards will be up in the gathering space the weekends of Oct 20-21 and Oct 27-28. Don’t miss the opportunity as they go quickly! Our October Day to Serve will be on Wednesday, October 17 from 9:00am-12:00pm. We’ll be serving at Project C.U.R.E with MPB teacher Christy Dorchuck. Project C.U.R.E. is the largest provider of donated medical supplies and equipment to developing countries around the world. Sister MaryAnn will enlighten and entertain us a she shares “Eating Your Way through the Bible with Jesus”. Come travel between Scripture’ s lines and gain a new understanding of Jesus and His place at the table with His friends. Bring a friend, all are welcome! On Wednesday, October 24th, the 2nd Half of Life Ministry will be sponsoring another VINO VERITAS- “in wine there is truth”. Join us at Citron Bistro (Hampden and Yosemite) from 5-7pm for dinner (order from menu) and a presentation and discussion led by Fr. Pat. Space is limited. RSVP to Christine at the parish office or at cmaschka@mpbdenver.org by Friday, October 19th. The mission of the The Delores Project (TDP) is to provide safe, comfortable overnight shelter and services to unaccompanied adult women who are homeless and have limited resources. TDP assists women in developing the skills and resources necessary to stay off the streets and move towards stability. For close to 20 years MPB has supported the ladies at TDP through meals and other resources. It is estimated in 2017-18 your donation of 108 meals was valued at over $31,000. Thank you! Because of the construction on our campus and also the transition occurring at TDP to their new location, our meal support will be changing and TDP is experiencing a critical need for nightly meals. October Gathering, Thursday October 11 at 6:15pm in the Gathering Space. Our 2018 Annual Report is here. The difference between income and expenses for the entire campus was a surplus of $360,000. These funds went into savings so we can continue to maintain our aging campus. We saw a 45% increase over 2017 results of financial support and donated goods by our parishioners to the now 53 organizations served by our social outreach programs. One out of every three of parishioners’ volunteers in any number of ways across our campus. We are truly living the mission of our faith! 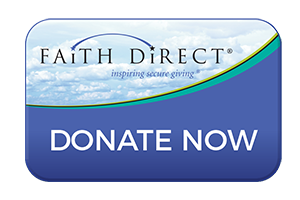 We have seen an increase of nearly 8% in our weekly offertory, and about a third of our families use Faith Direct, our electronic giving tool. How do we compare with other Catholic parishes nation-wide? To date, 55% of our registered parishioners have pledged or given to the Here for Good campaign. Nationally, only 15-25% of registered parishioners support their capital campaign. We are proud to share that 61% of our registered parishioners support MPB through the offertory, compared with the national average of 45% to 55%. We now a have a live construction camera. Click here to check out the construction of the Parish Offices. Picture refreshes every few minutes. Join us for a three- part series this Fall examining three areas of “stuff” we deal with at this stage of life. All three evenings will take place in the Gathering Space/RCIA Room from 6:30-8pm. Let’s poke around at our present relationship to clutter. I believe that making space can be a CREATIVE process (not so scary) and can lead to greater creativity and freedom at this time in our lives. Please bring your questions! This evening will address the interests of those who attend. Frank will explore with us questions like: Do you know the optimum age to file for Social Security? What’s the difference between Medicare and Medicaid? What are my options for Medicare plans? I’m a low-income veteran. What programs are available for me? What do I need to do to file for Social Security Disability? All ladies are welcome, bring a friend and build community! Looking for an opportunity to serve others? Day to Serve is kicking off its second year. This is a collaborative ministry combing MPB school staff and MPB Social Outreach ministry. Each month, a teacher leader will join volunteers at a service site to serve others. This is a great opportunity to build community while experiencing the many amazing charitable agencies across the metro Denver area. Birthline is an organization which supports the lives of the unborn by supporting young women with counseling and support. Birthline needs 75 volunteers to help sort donated clothing items. Bring a chair, “sit and sort” and meet new friends as you help these young moms. Carpool from MPB leaves at 9:15 am (please indicate on sign up if you’d like to carpool from MPB). Lunch & bottled water provided. More Opportunities to Serve in September! Delores Dinners tinyurl.com/DeloresMPBSept18 and Sunday Lunch Program tinyurl.com/SLP1Sept18 need helpers in September. Both require little time, but a big heart to help! Please check out these opportunities. Feast day of Blessed Frederic Ozanam founder of the Society of St. Vincent de Paul Frederic’s first act of charity was to take his supply of winter firewood and bring it to a widow whose husband had died of cholera. Today your Society of St. Vincent de Paul members visit our neighbors and assess their current needs. Recently, two MPB Vincentians made a home visit with a patient who was going through a second treatment for brain cancer and the prognosis was not good, with only months to live. This person was not able to work because of seizures and was behind on rent. Our Society of St. Vincent de Paul was able to help this patient with rent. The gratitude expressed at this visit was unbelievable. We were able to do this because of the generous financial donations of this parish. Society of St. Vincent de Paul will have special collection envelopes in the pews the weekend of September 29th and 30th. Thank you for contributions. Meditation and Movement: Please join us for Meditation and Movement on Tuesdays, September 18, 25th (RCIA Room) and October 9th (Music Room), from 5:30-6:30pm. The theme continues from the previous session “Practice the Pause, Pray Unceasingly”. Hope you can join us! MPB has ministers who are available to bring Communion to the homebound of our parish. If you or someone you know would like to receive communion at home, please contact Christine at the parish office. For those who are registered, please remember the parent meetings for sacrament preparation for First Reconciliation and Restored Order are coming soon! Restored Order- Saturday, Sept. 8 at 10:00 in the church or Thursday, Sept. 13 at 6:30 in the cafeteria. Registration is open on the website for the FAITH program and Sacrament Preparation until August 31. Thursday, July 12 at 6:15 pm. MPB School Supply Drive Aug 4-5. Check back for more details. Communion for the Homebound is a special ministry that brings the Eucharist to parishioners who are homebound or in a nursing facility. Eucharistic Ministers visit weekly or bi-weekly to pray and share the Eucharist with those who can’t be with us on Sundays. If you would like to be a part of this ministry, contact Christine Maschka in the parish office or atcmaschka@mpbdenver.org (Training provided).